Too true… and I had a chunk bitten out last month on a campaign I run for a popular site. I was just updating my campaigns and I saw that several files had been uploaded and ‘approved’. Yet I only update via the web-based service as their download/upload process is worse than clicking through the pages (hefty note to Yahoo! – you want me to put more than one ad up? then YOU make it easy for me to do so!!). So, how did these files get there? You see, the truth of PPC is that they WANT you to focus on CPC and CTRs rate because that’s how they earn their juice. So Yahoo’s actions are all about increasing clicks by ‘improving’ ad copy and keyword range. I expect they had a meeting in Yahoo! towers and decided that all their clients were cretins and were deliberately ignoring that pop up that they’ve had for over a year now which deliberately hides the ‘save’ button with this message (look right). No, I have seen it many, many times but I am not going to put another ad up because I use Google to optimise my ad copy because they have all the traffic to test effectively and their system is so much more user friendly than Yahoo’s. Simple, really. Generously, Yahoo! gave me a refund. I explained to them on the phone that whilst they can provide me with the service, I did not request or authorise these changes and should they continue to do so I just wouldn’t bother with their system. But it still confuses me… why does Yahoo! go about their business in such a cack-handed way? Fair enough Google and MSN also offer assistance in optimisation – but it’s on request and always as a test. Well, the truth of the matter is that I don’t know the answer to this, but I will vote with my feet and if I see them messing around again, I will shut it down. Any advertiser knows that they need to sign off the creative and campaign. Yahoo! please step down and visit the real world. Please. Not sure if lurches is the correct thing but as broken on Twitter by Kara Swisher, Jerry Yang has agreed with the Yahoo! Board to step down as CEO once a replacement has been found. So, the mega ‘deal’ that Yahoo! struck with Google to get Microsoft off its back has backfired, or if not backfired, at least ‘back-burnered’. Adviking is not one to miss a chance to get on a soapbox, however before we crack open the bubbly and mull over anti-trust issues of market dominance… we can’t help but feel, regardless of press releases and articles to the contrary, that it leaves Yahoo! on the sidelines and Google smirking at the flimsiness of the competition. Will Microsoft return to the table? They envy the Yahoo! search traffic for sure, but as Social Media starts to gain more leverage and prominence, will Yahoo! properties lose their lustre somewhat? Their mail app is generally considered to be class-leading (much to Google’s chagrin), but what else have they got? We can’t help but feel that this will be the case… Google got the Yahoogle out of there and has abandoned ‘Junior’ and, for all the credibility Jerry Yang has left, it can only be a matter of time before there are more movements in this space. As always, we’ll be watching. In a few years will Yahoo! be Ya-who? No time to comment on this yet… Some stuff here on AdWeek and here. Agree with JB don’t buy it as a revolution. NEW YORK, Sep 24, 2008 (BUSINESS WIRE) — Emmy(R) Award nominee and Golden Globe(R) Award winner Jon Hamm of AMC’s original drama series Mad Men(R), today joined Yahoo!’s Chief Executive Officer Jerry Yang, President Sue Decker and Executive Vice President of Yahoo! U.S. Hilary Schneider for the 5th annual Advertising Week conference in New York to announce the launch of APT from Yahoo!. Formerly known as AMP!, APT from Yahoo! is an intelligent innovation in online media, a digital advertising solution that streamlines the process of planning, buying and optimizing display advertising. APT is designed to simplify the process of buying and selling ads online while connecting all the market players — publishers, advertisers, agencies, networks, partners and developers — from a unified platform to do business more efficiently and effectively. The platform is rolling out as planned in phases beginning with publishers the San Francisco Chronicle of Hearst Newspapers and San Jose Mercury News of MediaNews Group. As a Web-based solution with the potential to allow unprecedented ease of cross-selling across the largest open network of publishers, advertisers, ad networks and agencies from a single integrated interface, APT is a single platform for connected digital advertising, including ad serving, ad network and ad exchange. It is designed to streamline advertisers’ ad-buying process for multiple accounts across multiple publishers, and enable creative testing and campaign optimization. It is also intended to help advertisers precisely yet easily identify audiences through geographic, demographic and interest-based targeting while enabling publishers to better monetize their content as well as making better connections across the Web. — Allowing publishers to manage their own private networks. Yahoo! has developed a systematic integration plan for adding other Newspaper Consortium partners onto APT throughout this year and into next year. APT is a significant component of the unique and deep collaboration between Yahoo! and America’s newspapers. Launched in 2006 with 176 newspapers across the United States, the strategic partnership to create one of the largest and most comprehensive advertising networks in the online industry now comprises 35 media companies spanning 784 newspapers. Yahoo! will start to make the platform available to other parties including advertisers, publishers, networks and agencies in 2009. Additional information on APT is available at http://apt.yahoo.com. For press materials including executive bios, APT screen shots and images visit http://apt.yahoo.com/newsworthy. Yahoo! Inc. (Nasdaq:YHOO) is a leading global Internet brand and one of the most trafficked Internet destinations worldwide. Yahoo! is focused on powering its communities of users, advertisers, publishers, and developers by creating indispensable experiences built on trust. Yahoo! is headquartered in Sunnyvale, California. For more information, visit pressroom.yahoo.com. The Yahoo! 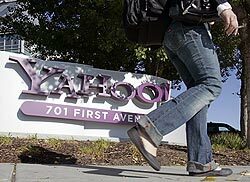 logo is a registered trademark of Yahoo! Inc. All other names are trademarks and/or registered trademarks of their respective owners. Following on from AdViking’s attempt to liveblog the meeting earlier, some quick round up points. There was some fireworks from the audience but the vote went ahead smoothly and other than the Ichann change and the ex-AOL honcho Jon Miller on/off switch, everyone still has their seats. We had a great strategy. MS bid made us focus on something else Still, we have traffic, the Internet is great it’s just our tech isn’t so hot & we have loads of talent (ignoring the fact of the recent exodus). Here’s link to the deck they gave. Not that interesting in itself but some good points to pull out for industry trends. Actually that sounds better than attending. The Mercury News link above is providing live transcript. Most interesting is that exec pay is out of whack. Funniest, but totally not is about Yahoo! issues with human rights. One guy re-quotes something about Y! mgmt being “moral pygmies” – Response being that quote is an insult to pygamies and the because of the issues in China, that Jerry Yang should enjoy his visit to the Olympics. Some peanut gallery comments about the Plumbers Union who wanted the pay review. Y! opposes Human Rights, Pay Review and Censorship Review Shareholder Proposals. As Ballmer would say, blah blah blah…whatever guys. You had this amazing strategy and Microsoft got in your head and you did a deal with Google that will kill your business. On reflection, it didn’t really….some great quotes and some interesting Shareholder Proposals but nothing really that persuasive from the Y! board as to why they should keep their jobs. AdViking will have a ponder and come back with a summary. In what’s probably a sad indication of the excitement factor in AdViking’s life at the moment but I’ve woken up this morning with a thrill that today’s finally the day of the 2008 Yahoo! Annual Meeting. We can expect fireworks, what with threats from the big shareholders, questions about turning down Microsoft and what’s that the Google/Yahoo! ad deal now has politicians demanding the deal gets a good look at. All ready, we’ve got the somewhat deflating news that Carl Ichann will not be attending, maybe he’s be sending Ballmer instead! The meeting will start at 10am Pacific and webcast here.